On 8 June 2015, Apple previewed its next Mac operating system OS X 10.11 El Capitan on WWDC. On 22 July 2015, Apple seeded the Public Beta 2 of OS X 10.11 El Capitan. As time goes on, we are closer to the release of this latest Mac OS. 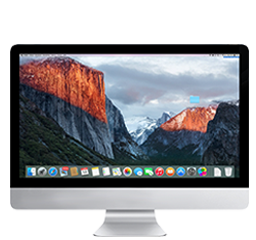 Although El Capitan lacks brand-new features and mainly focuses on performance, stability and security, it is welcomed by many Mac users, especially for those experiencing performance issues on OS X Yosemite. Apart from caring about new Mac OS X 10.11 El Capitan release date and features, some people are likely concerned about the system compatibility. Will it be compatible with previous software programs? For DVD collectors and DVD ripper addicts, they may wonder if it is workable to rip DVD on OS X 10.11 El Capitan. Don't know if you can continue to use your former programs, but it is sure that ripping DVD on Mac OS X 10.11 El Capitan is doable with the best Mac DVD ripper. How to Rip DVD on Mac OS X 10.11 El Captain? 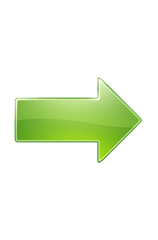 Fast rip regular or copy-protected DVDs/ISO files/DVD folders to MOV, MKV, M4V, MP4, H.264, Mac, iPhone, iPad, Apple TV, Android, etc. on Mac OS incl. OS X El Captain. 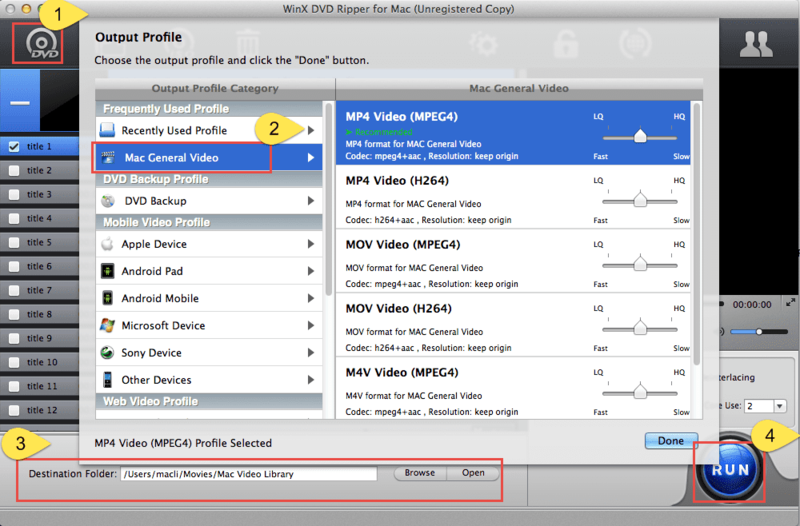 This article focuses on delivering the step-by-step guide to rip DVD on OS X El Capitan. But before any further, it is necessary to sort out the most suitable DVD ripper for Mac OS X 10.11 El Capitan. There are numerous DVD rippers in the market, but only a few are equal to this task when we take several standards into consideration, including OS compatibility, supported input source, supported DVD copy protection schemes, output profile, ease of use, help & support, etc. And one of the most reliable DVD rippers for El Capitan is WinX DVD Ripper for Mac. 1. Fully support for Mac OS X Tiger and higher, including OS X 10.10 Yosemite and OS X 10.11 El Capitan. 4. It offers 320+ output formats, enabling Mac (OS X 10.11 El Capitan) users to convert DVD to MOV, M4V, MP4, MKV, WMV, AVI, MP3, etc. 5. It is armed with 350+ preset profiles helping Mac (OS X 10.11 El Capitan) users to rip DVD to iPhone, iPad, iPod, Apple TV, iTunes, iDVD, iMovie, Mac, Android phones/tablets and more directly. 6. It features a straightforward interface and design, thus no one can have trouble with the operation of ripping DVD on Mac OS X 10.11. Even if someone encounters problems, they can fast get help from built-in help document, online tutorials or support team. If you are satisfied with this Mac DVD ripping software, simply free download, install, launch it, and follow the guide below to rip any DVD on OS X 10.11 El Capitan, such as Jupiter Ascending DVD, Kingsman: The Secret Service DVD and The Hunger Games: Mockingjay Part 1 DVD. How to Rip DVD on Mac OS X 10.11 El Capitan with Ease? Step 1 – Load DVD content. Insert DVD disc to the DVD-ROM, and click DVD button to load the DVD disc content. To make it easier, this DVD ripper will detect the main title for you automatically. And certainly, you can define any title as you like. Tip: You can also input ISO file or DVD folder for DVD ripping on OS X 10.11 El Capitan. Step 2 – Select output profile. This smart Mac DVD converter will pop up the Output Profile window spontaneously after loading the DVD content and specifying the main title. In this step, you just need to choose your desired format/device as the output. Step 3 - Set destination folder. Tap "Browse" button, and then you can choose a folder on your Mac or an external device to save the ripped DVD content. Step 4 – Start ripping DVD on OS X 10.11 El Capitan. When all settings are completed, simply press "RUN" button at the lower right corner of the main interface to move to the DVD ripping process. Note: The software developer only advocates ripping DVDs for personal use and suggests referring to the DVD copyright laws in your countries before doing so. Rip/convert any general and commercial (movie) DVDs to MP4, H264, AVI, WMV, MOV, MPEG, FLV, 3GP, iPhone, iPad, Android, Windows Phone, Xbox, PS3/4 etc, with crisp images and hi-fi audios at a sharp DVD converting speed.